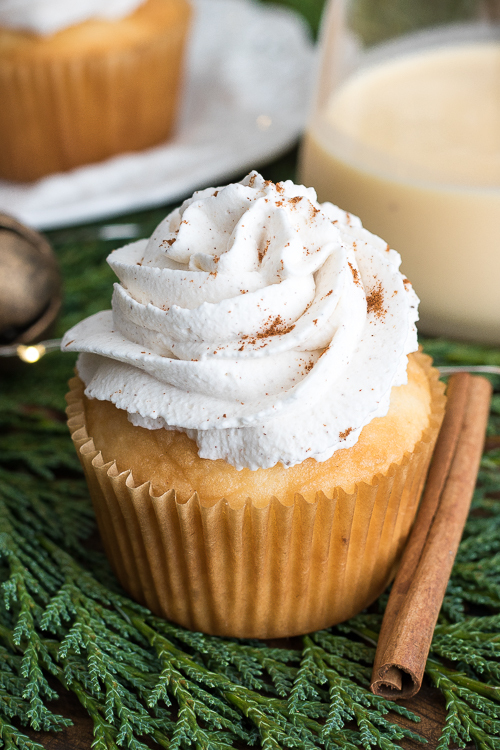 Eggnog Cupcakes are a festive treat loaded with Christmas flavors! 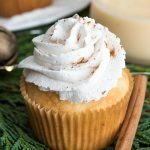 This eggnog cupcake recipe is super easy even though the directions might make you think twice about making it. Trust me, these cuties are worth it! These cupcakes have three elements to them, the cupcake, the filling, and the topping. 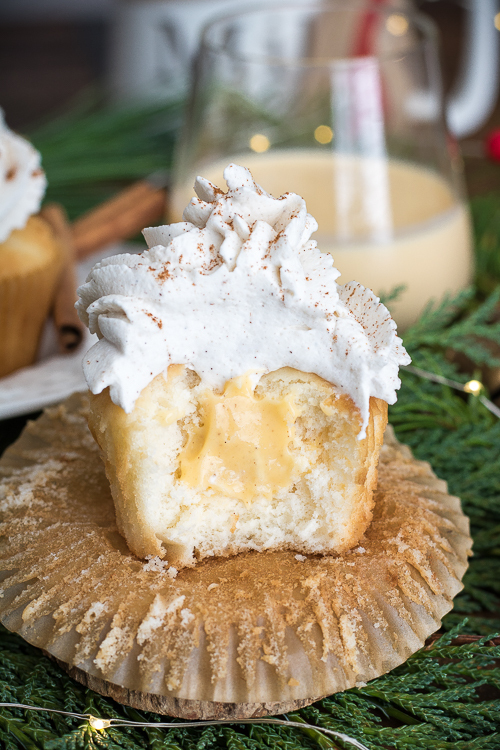 The cupcake is made with a boxed white cake mix where I have added eggnog to the mix, you can still make eggnog cupcakes from scratch by substituting your favorite white cake mix, adding eggnog for the liquid. The filling is a homemade eggnog pudding. To make this step a little easier, feel free to use a boxed instant vanilla pudding mix, but use eggnog instead of the milk! I used a cinnamon whipped cream for the topping with a garnish of ground cinnamon to bring everything together. Again, you can use whatever frosting you prefer for the topping. 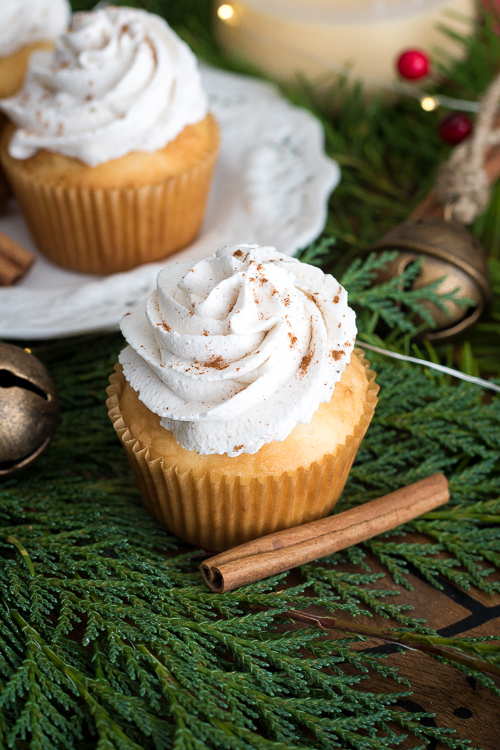 I used a stabilized whipped cream because I wanted to keep everything about these eggnog cupcakes light and airy. - So, with three separate elements to these cupcakes, just work on one at a time and you’ll be good to go! - First, make the eggnog pudding so it can set up in the fridge, which takes three hours. While that is setting up, make the cupcakes, they have to cool completely before filling and frosting but that three-hour wait will be plenty of time. 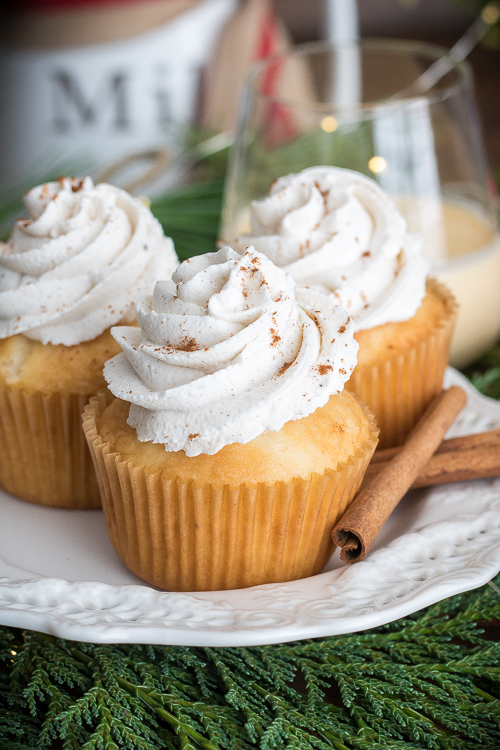 - Last, right before serving, make the whipped cream, top filled cupcakes with the whipped cream, garnish with cinnamon or nutmeg and you’re done! How do you fill the cupcakes? Super simple, fill a pastry bag with the pudding, put a medium to large sized round tip on the bag. Press the tip into the cupcake so it is about 1/2 inch in, squeeze the bag slightly and you will be able to see the cupcake plump up a bit, fill to the edge and that’s it! One little note about the cupcake batter. When making the batter, you might think you have done it wrong. The consistency ends up being a little bit like marshmallow fluff, that’s how it’s supposed to be! This makes a super, light and airy cupcake! This might not happen with a homemade white cake recipe though, but it will with a boxed mix. I really hope you enjoy today’s recipe! Please stop by my blog, https://ThisSillyGirlsKitchen.com for even more yummies! In a medium-sized pot, add the sugar, cornstarch, salt, and cinnamon. Whisk to combine. Slowly whisk in the eggnog making sure there are no lumps. Whisk in the eggs until fully incorporated. Turn heat on to medium, whisking constantly until thickened, 5-8 minutes. Pudding should coat the back of a spoon. Immediately pour into a medium-sized bowl, add plastic wrap so it touches the top of the pudding. Place in the fridge for 3 hours until set. Preheat oven to 350 degrees. Place everything in a large bowl, with a hand mixer beat on low for 30 minutes to combine. Beat on medium speed for one minute, the batter will resemble marshmallow fluff. Fill cupcake liners 1/2 full. Bake 12-14 minutes until a toothpick inserted in the center comes out clean. Place cupcake tin on a wired rack, cool for 10 minutes. Take cupcakes out and let cool completely. Cupcakes have to be completely cool before adding filling and topping. With a stand mixer or hand mixer, place the whipping cream in a large bowl. Slowly add the powdered sugar at slow speed. Whip until soft peaks form. Add the cornstarch, vanilla, and cinnamon. Whip until cream will stand up on its own, hard peaks. Do not over beat or you will have butter! 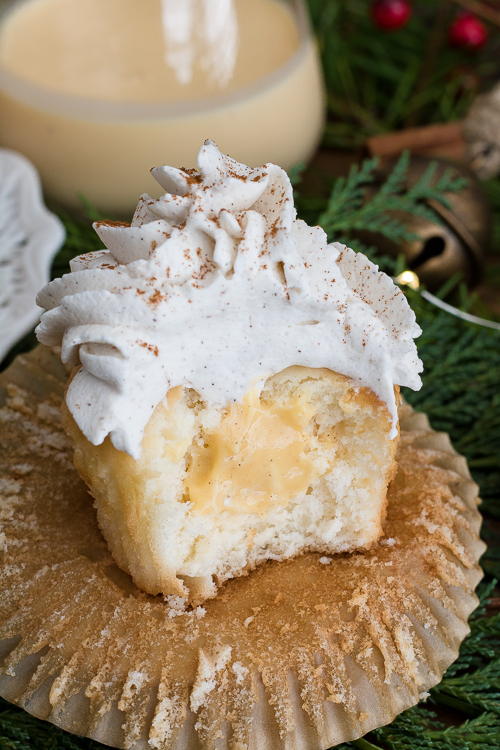 Pipe eggnog pudding into the center of the cupcakes, top with whipped cream and garnish with more ground cinnamon or freshly ground nutmeg. I suggest starting with making the filling, then the cupcakes, then the whipped cream. The pudding filling needs to set up in the fridge for 3 hours before filling the cupcakes.